Author Paul Wieland and Triumph books offers one of the more interesting titles of the 2008 hockey book season, especially if you are a fan of the Buffalo Sabres. Then Perreault Said To Rico... The Best Buffalo Sabres Stories Ever Told is a 200-plus page collection of the many interesting and humorous stories, many behind the scenes, about the Buffalo Sabres and some of their famous (or in some cases infamous) players and coaches. There's that infamous Fog Game. Jim Lorentz's slaying of a bat. Gilbert Perreault and the Wheel of Fortune. The fictional Tara Tsujimoto of the Tokyo Katanas. Mike Foligno's emphatic jump. The Donut King's tragic death. Oh, and two little known Sabres known as Eddie Iceberg and the Turtle. And, of course, lots and lots of stories of practical jokes, hijinks and drinking exploits. The book is full of rollicking stories that will leave you telling all your friends about the latest entry you've read. The book also serves as historical compendium of sorts, though more from the vantage point of what went on in the locker room, on the ice and behind the bench. So much of the Sabres nearly 25 years are covered here. Wieland touches on how the Knox brothers convinced the NHL to give Buffalo an expansion team in the first place. He looks at the formation of the French Connection line, Punch Imlach's great imprint on the 1970s teams, and the team's meteoric rise to Stanley Cup contenders after just five seasons in the league. He looks at the contributions of Tim Horton, Roger Crozier, Danny Gare, Craig Ramsay, Jim Schoenfeld and so many more. Wieland has been collecting these stories for years because he had great access to the team and it's cast of characters. Wieland joined the Sabres early in their inaugural season, and spent 25 years serving as public relations director, communications director and executive producer of television sports for the team's TV broadcasts. In that time he was able to mingle with many of the Sabres greatest players, collecting the hilarious stories. He even got Scotty Bowman to write a forward for this book. Wieland left the Sabres in the mid 1990s and has become a professor at the Jandoli School of Journalism at St. Bonaventure University in northern New York. He has also taken to writing, and is also working on a novel to be released at a future date. The book has a cover price of $22.95, and that also includes an exclusive audio CD featuring interviews with many of the Buffalo Sabres greats. There are also some rare, interesting, black and white photos scattered sparsely throughout the book. All in all I have to say that this is a fun book. 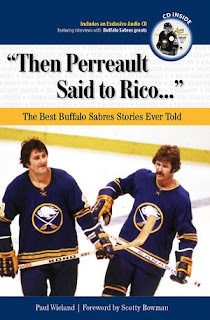 I have absolutely no reservations in say that if you are a fan of Buffalo Sabres, especially of the old Sabres teams of the 1970s, this book is a must have. I am reading this book and I am on page 39. In referring to the Tim Horton Restaurants he writes: Buffalo has dozens in the metropolitan area, but Rochester, just 60 miles down the road, doesn't have any! The book was copyrighted in 2008. In 2002 Rochester opened a coffee roasting plant and opened 4 Tim Horton restaurants in Rochester. Today Rochester has 27 restaurants in the Rochester area.